Last week I made a new vision board, after several sessions of clipping words and images from a variety of old magazines from the local libraries. The new vision board is very different from the one I made in 2009 and burned a few months ago. The focus this time is one simple word: WHOLE-HEARTED. What strikes me, gazing at the new vision board, is what's left off -- even among the words and images I clipped. There's nothing on this vision board that has to do with fame or fortune, or how other people respond to my artwork. There's no mention of exhibitions or reviews. There's one word about a GALLERY -- apparently connected with "muse" and "woman power." The big emphasis is on wild places -- including the inner wild -- and bold adventure. A few cities are mentioned, including Champaign-Urbana where I grew up (practically on the campus of the University of Illinois) -- and Chicago, where I came of age. Berlin and Paris are present -- the cities where I learned to travel and look and find my satisfaction from the inside, departing from the standard career path for blacksmiths and finding my own way instead. The big "art career cities" -- New York City, LA, and San Francisco -- are conspicuously missing. The "Mario" on the vision board refers to Mario Martinez and his Mind Body Code work. I interpret "wild workspace" and "a lucky break in disguise" as referring to my longterm longing for more studio space. Maybe the answer will lie in working outdoors a lot more -- painting the heart energy of trees, for example -- and in painting at residencies. This looks and feels like a biophilic blissful life -- radical feminism without the political/socialdrama. Take your time clipping words and images. Try some magazines you'd never usually read. Your local library probably has lots of free magazines that patrons have donated. Relax and be spontaneous; be open to surprises about what you cut out and what you don't. I used black foam board as the background this time. Poster board is OK too, but it's so thin that it's harder to move around and place wherever you want. I can prop the foam board on any easel or just against a wall. Write a word or phrase that's the focus of your vision board. I didn't do this till I was done clipping words and images, because I wanted to stay open to possibilities that my conscious, logical mind might close out. Of course you can choose any focus: the home you want, the prosperity you want, a new job, anything. It just needs to be your deep heartfelt desire. If I were doing this new vision board over again, I'd glue items down as soon as I placed them. I did this, luckily, with a few big background images. Later, though, it was tedious to glue down layers of small pieces. The original layout was a little better, I think, than the final result, because of this. Next time! 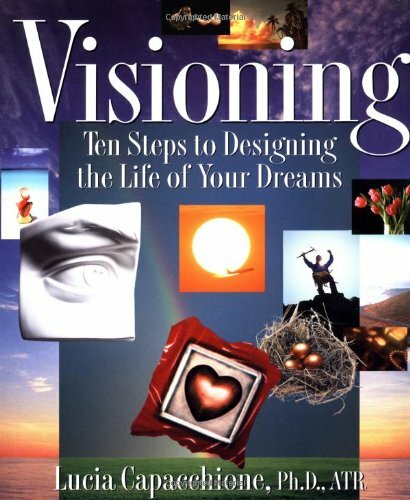 An excellent guide to this process is "Visioning," by Lucia Cappachione. She has lots of encouragement and tips on using a vision board after you make it. 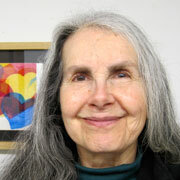 For example, she suggests looking at the vision board every morning and letting any doubts or questions surface. Write them with your dominant hand, and free-write answers with your non-dominant hand. This will help you keep moving toward your vision. You can find lots of articles online, too. Why not just use Pinterest? Or a scrapbook? These are good, too! Why not use Pinterest and a scrapbook to amplify what you discover after making a vision board? Or print out some images from Pinterest to glue onto your board? There's something about the physicality about cutting out things from magazines, though, that's different. You can trust your hands on the mouse or trackpad or touchscreen, sure. But there's a different neural pathway, I think, when it comes to more hands-on creating. Note that in addition to Pinterest and scrapbooks, you can gather material different ways to enhance your creative process. I've always loved Twyla Tharp's method of setting up a big cardboard storage box for each creative project idea -- and just throwing in anything that seems to fit with it. Very right-brain! And the prolific author, Don Aslett, sets up empty folders for all his book ideas and throws in notes and articles and images whenever he encounters them. The obvious advantage to a vision board is its size and visibility. You can see the whole picture at once. You can keep a clear focus while all the aspects and parts are visible in relation to it. If you decide to make one -- savor every minute of making it. Here's to your life! Many blessings on your vision.